You can create your own database using only Windows Motepad, or any ASCII text editor, and use the database with Internet Explorer. Your database can be used as an address book, recipe file, collection catalog, or any of a thousand uses. You can create your own database using only Windows Motepad, or any ASCII text editor, and use the database with Internet Explorer. Your database can be used as an address book, recipe file, collection catalog, or any of a thousand uses. The example database will contain all the different modes which can be set for a computers display. The database that I am describing will be a flat database. Whereas a relational database contains several tables, along with relations between the tables, a flat database contains only one table. The disadvantage of a flat database is that sometimes data is repeated in the table. A database is really just a table, each column in the table represents a field. Each row in the table is a record. You need to determine what fields you will need in your database. The example database will contain all the different modes which can be set for a computers display. 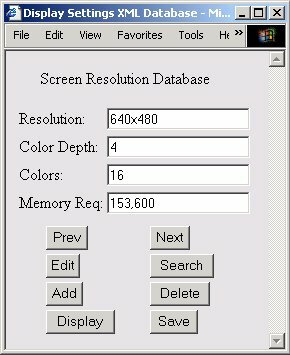 Each record will contain the fields; resolution, number of color bits, number of colors, and bytes of memory for a full screen. Shown below is one record in the table.